The Dakota Free Press has a raging thread going on that reveals why corruption is so successful in South Dakota. It reported on Bob Mercer's newspaper report that the United States Immigration and Citizenship Services has notified the state that it is disqualifying South Dakota from participation in the EB-5 program because of corrupt practices. In response to Cory Heidelberger's post, some GOP loyalists say his liberal bias disqualifies everything he reports as anti-conservative speculation. One commenter insists that there are no crimes involved outside of Cory's speculations because no charges have been filed against specific persons. If there were any substance to the accusations of corruption, the misinformation and illogic contends, there would be charges filed. The argument states that some of the revealed incidents might be unethical, but a violation of ethics is not a crime. Therefore, the accusations of corruption in state government are without foundation. 1 having or showing a willingness to act dishonestly in return for money or personal gain: unscrupulous logging companies assisted by corrupt officials. • evil or morally depraved: the play can do no harm since its audience is already corrupt. • archaic (of organic or inorganic matter) in a state of decay; rotten or putrid: a corrupt and rotting corpse. The twisted response to the Dakota Free Press assails the idea constantly expressed in blogs that the single-party government that has ruled South Dakota for decades has established a regime that practices and encourages corruption and has put in place a bureaucracy that serves the interests of greed and perfidy held by the party leadership. Under the Janklow administration, the law which gives officials the right to withhold from the public information about state collusions with private corporations was bolstered. Legislation carried in the legislature for Janklow by Mike Rounds made it a crime for any state official to reveal when a corporation involved with the state was under investigation--the infamous Gag Law. What seems to rankle the GOP loyalists most is the implication that a plurality of voters has kept in place a regime that represents the values of the plurality, which is that any way to make money is encouraged and the prime, motivating human values are greed and perfidy. The defense of greed and perfidy is articulated by the conservative comments on the Free Press blog, with a thread of more than 300 comments. What is disconcerting to outside observers is that the defense of nefarious activity takes on the aspect of representing the dominant culture of the state. In other words, state government is corrupt because a majority of the people condone corruption. The deniers contend that the record of perfidious transactions and missing money do not denote corruption. They further contend that the failure of the state or the U.S. Dept. of Justice to file criminal charges absolves the state of any accusations of corruption. Over the course of the developments of the EB-5 scam, one of the commenters has insisted that the loss of over a hundred million dollars by Asian investors is business as usual for South Dakota. He said the Chinese investors knew that their investments were a risk and what happened to them is not a consideration. It is just business. However, the investors do not share that attitude. They understood that they were investing venture capital for which there is the risk of failure, but they also expected that a state-sponsored agency would not be involved in embezzlement and fraud. Or that a program would be run in such a way that the money could not be accounted for. And it is in that expectation that the impetus for the U.S. Immigration and Citizenship Services to ban South Dakota from participation in any further EB-5 activity arises. Northern State University has a long relationship with Chinese nationals. (I have been these adviser for Chinese graduate students.) While the press has not covered what has happened to the Chines and Korean EB-5 investors or how they have responded to the failure of Northern Beef Packers, it is difficult to be associated with NSU and not be aware of of the concerns of those investors. With the establishment of the Confucius Institute on the Northern campus, the relationship with the Chinese is closer and more sensitive to factors that affect it. The bilking of investors cannot be ignored, and the pressure exerted to obtain an accounting of how the investments were handled is a constant presence. The U. S Immigration and Citizenship Services is the agency on which those concerns are registered. It has an ombudsman to help resolve issues that confront holders and applicants for green cards. The status of green cards for the EB-5 investors is an obvious and serious factor that the agency must deal with, although it is an issue seldom mentioned in reports and discussions of the EB-5 debacle. Consequently, it is also of concern to Northern State University which has developed an important relationship with China. The State of South Dakota and the Justiice Department may decline, for whatever reasons, to pursue the evidence, but the people who have invited Chinese and Korean interest cannot so easily dismiss the obligation to provide honesty and frankness in their dealings. The denial of responsibility for any wrong-doing to people of the state and the EB-5 investors is a matter of basic cultural values. The revelation of how deeply and firmly that bilking, perfidy, greed, and dishonesty has been ingrained in a portion of the population as a legitimate business activity is cause for alarm. It raises the question of why anyone would do business in a state governed by such principles. The Dakota Free Press gives an outline of the political dividing points in South Dakota and portrays a conservative mental attitude that possesses much of the American right wing. The Godfather and The Sopranos may be good stories, but some people regard these tales of the mafia as scriptural dicta. A large portion of the South Dakota population has been conditioned as Manchurian candidates to not only condone predatory financial schemes but to encourage and facilitate them. The guns of autumn have taken on an ominous significance in South Dakota. In October of 2013, Richard Benda told friends and family he was going pheasant hunting. On Sunday, the 20th, he went to Lake Andes to the farm of his sister and brother-in-law. On the 22nd of that month, his brother-in-law found his body on an abandoned farmstead nearby. The attorney general's office officially termed the death a suicide, although decisions and statements coming from Pierre are notoriously untrustworthy. The official report said he died of a self-inflicted shotgun blast to the stomach. 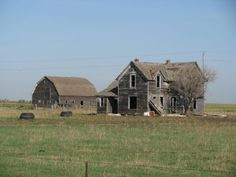 The abandoned farmstead where Richard Benda's body was found. Benda's death triggered the release of information about an economic development program he was involved in with the Governor's Office of Economic Development, the EB-5 investors, Northern Beef Packers, and the South Dakota Regional Center. Benda has been accused of embezzling money about which number of people had knowledge and complicity. But the powers that have arranged to bury those complications in the copse of autumn trees where Benda's life ended. 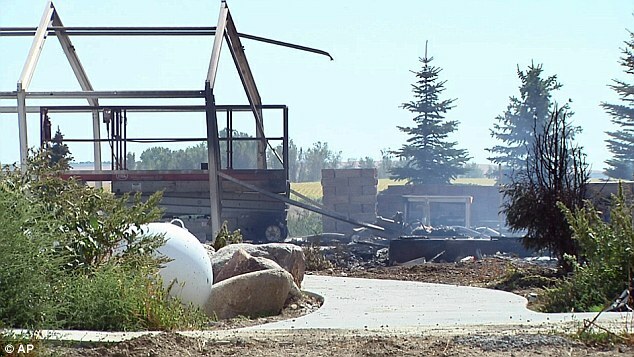 In the early hours of the morning of Thursday, Sept. 17, firemen were dispatched to the $1.3 million home of the Scott Westerhuis family near Platte. They found six bodies in the smoldering ruins. Scott, his wife, Nicole, and their four children, Michael, 16, Connor, 14, Jaeci, 10, and Kailey, 9, were all found dead by shotgun blast. The Attorney General's official statement said Scott killed off his family, set the house on fire and then turned the gun on himself. The ashes of the Westerhuis house where the family's six bodies were found. These deaths, too, prompted the release of information about financial dealings. Scott Westerhuis was the business manager for the Mid-Central Education Cooperative and Nicole was assistant business manager. Hours before the massacre and arson, the cooperative had been notified by the state Department of Education that a contract for administering a $4.3 milion federal grant with the co=operative was being canceled. Records from administration of the grant show officials listed as consulting administrators with high stipends and the creation of a layer of non-profit corporations to implement the grant to prepare American Indian youth for college. Audits of the grant raised questions about the administration of the grant, but the specific points of examination that raised the question have not been explained. The cancellation of the contract leaves the GEAR UP program for the native American youth in limbo. To experienced academics who have obtained and administered grants, the numerous and exorbitant consulting fees, the layers of non-profit corporations to administer the grant, and vague accounting of just what was being paid for are incomprehensible. The target benefactors of the grant are young native American students who the interest and ability to go to college and to provide them with educational experiences and skills that will enable to get into and succeed in college. The questions that immediately occur to bona fide mentors are just what kind of academic program was devised for these students and what percentage of money was directly expended on the students? The administrative arrangement appears to be an obvious scheme to bleed off the funds through an elaborately contrived system of graft. What the EB-5 scheme and the Mid-Central Education Cooperative have in common is that educational programs were used as cover to manipulate money from government programs into the private pockets. The EB-5 scheme had its origins in the South Dakota International Business Institute at Northern State U. Faculty both on that campus and its sister institutions questioned just how the activities of the SDIBI involved academic research and benefitted students. The question was never answered. However, a new president at NSU apparently asked just how money from the university budget for the SDIBI was applied to educational purposes and found that it actually was not. So, he ended the program as part of the university and its director moved off the campus into the offices of the Aberdeen Development Corporation and took all the records which purported to show what the program was doing with him. While the university was not involved, the director of the program was able to write a contract with himself to establish the South Dakota Regional Center which recruited and collected the EB-5 investments from Korean and Chinese investors. In doing so, he did things, including getting sued, under the cover of the Board of Regents in a messy tangle of financial manipulations. The South Dakota Gojvernor's Office of Economic Development and the Board of Regents have managed to maneuver and obfuscate evade any accountability for the schemes that w ere hatched in the name of education and the taxpayers of South Dakota. The Mid-Central Education Cooperative was not so wily in setting up GEAR UP program. Audits turned up suspicious items that apparently the cooperative could not explain and, as with the EB-5 affair, ended in a blaze of shotgun fire and suicide. The pattern of scamming education is not peculiar to South Dakota. The former superintendent and CEO of the Chicago Public Schools and her cronies got caught doing the same kind of thing. Rather than choose suicide, she is pleading guilty. And rather than cover up the scheme, as is possible in South Dakota, the U.S. attorney is prosecuting. U.S. Attorney Zachary Fardon said during a press briefing. Fardon said Byrd-Bennett abused her position "to line her own pockets and those of her co-defendants." The indictment says the scheme netted Byrd-Bennett and her two co-defendants about $2 million in cash and other valuables, which prosecutors will seek to recover. Byrd-Bennett helped her former employer, an educational training and consulting collective, secure lucrative no-bid contracts for city schools, according to the indictment. In exchange, Byrd-Bennett received hundreds of thousands of dollars in kickbacks, which the collective disguised by funneling them into bank accounts set up under the names of Byrd-Bennett's relatives, the indictment alleges. The big difference between corruption in Chicago and South Dakota is that in Chicago it gets exposed and prosecuted.